Bienvenido al Proximo Nivel is a VHS cassette promoting Sega products in Spain. It came free with an issue of SuperJuegos magazine. 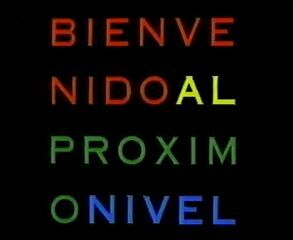 Bienvenido al Proximo Nivel demonstrates various games for the Sega Game Gear, Sega Mega Drive and Sega Mega-CD (and technically Sega Master System, though no footage is shown) set for release in 1994/1995, with re-dubbed live action segments sourced from other parts of Europe and the US. Also mentioned is the then-upcoming Sega 32X, although the footage on show comprises of projects in early stages of development. Generic dance tracks are played over gameplay footage, and the quality of said footage ranges considerably between games. Claims are made that Dynamite Headdy will arrive on the 32X and that Sonic & Knuckles has lock-on capability with Sonic Spinball, and the recycled live action footage means a Mega Drive II is seen, despite the redesigned console not seeing an official release in Spain. Star Wars Arcade is also played on what is quite clearly a normal Mega Drive. (Bienvenido al Proximo Nivel spends a great deal of time demonstrating older Mega-CD games as well as upcoming ones. New games start at Dracula Unleashed). With the exception of Star Wars Arcade, all this section is comprised entirely of pre-rendered promotional material.